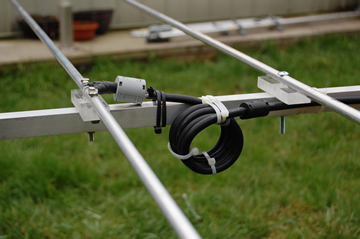 Ideal for novice of experienced builders alike - Due to the non-critical design on my OWA antennas, small errors in measurements and general construction will NOT greatly affect performance. Furthermore, no matching system has to be built in addition to the antenna, just a simple choke balun in the coax! Forward gain followed by front to back - This my seem a long way down the list but consider this. It is easy to load a rough model into YO and let it produce gain and drop the impedance, anyone can do this. What takes time is producing performance out of an antenna whilst maintaining a 50 Ohm feed impedance. It can be done! Antenna boom length - You will note most of my antennas provide between 98% and 99% efficiency. I produce an 'ideal' model shorten it slightly then re-optimise. Once this is achieved, I do it again until I get to a point where performance drops drastically. The SC0605S which I use started at 4.4 metres and finished at 3.4 metres long whilst still achieving over 10dBi forward gain. Most of the 'L' models are somewhere close to 100% efficient. Material considerations - I factor into my designs what materials are available and from where. Being UK based, the most prevalent Aluminum tubing available is 5. inch. as a result, most antennas use this diameter elements. There are exceptions to this rule though and I can re-model on a case by case basis if required. If you want the highest on paper performance you can find, try other antenna designs. If it is an highly efficient antenna system you are looking for which maximizes real life performance, look no further than the OWA design.